Adoptions are for a college bookstore the particular course material items that are required or suggested for any given course section during an academic term. As you might guess, this information directs all ordering for the store and it is imperative that it be accurate. Difficulty in management results in difficulty in accuracy. This window was a particular challenge. 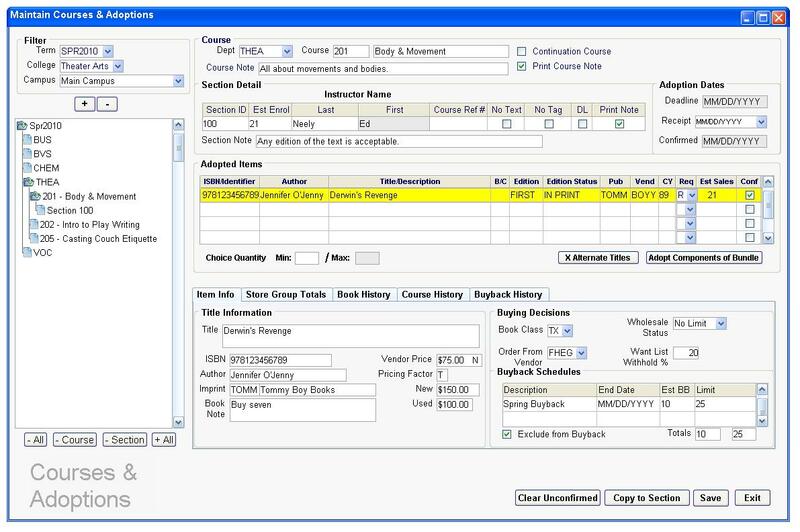 The legacy application distributed the management of courses, sections, their adoptions, and decision making historical data across six distinct windows, each of which was launched from inside of one of the other windows. Multiple daily tasks required users to go all the way down through each of the windows and then back out to the first or second window to make their changes, rinse, and repeat. My solution, though seemingly busy at first, brings all of this data into a single window. The picklist for courses (legacy window #1) has been replaced with collapsible tree sorted by term, then academic department. Course details, section data, and the list of adoptions (legacy windows #2, #3, and #4) cascade in the window proper from top to middle in descending order of scope. Finally, the item information and historical data (legacy windows #5 and #6) reside at the bottom of the window in a tabbed interface allowing this space to function as a data pour for whichever information is most relevant to the user at the time. The mockup shows the default size of this window, which due to legacy hardware spread across our user base, must fit to a 1024 x 768 window. The final product nicely expands to fit any size monitor allowing an expansive view of the course list and the adopted course materials. This is one of the occasions were I feel like this window was designed just about as well as it could have been in the space allotted in our development environment.